Are you looking for that perfect outdoor accessory for your backyard? We have just the product for you with our beautifully handcrafted Gazebos & Pergolas. Take a normal backyard and turn it into your perfect paradise. 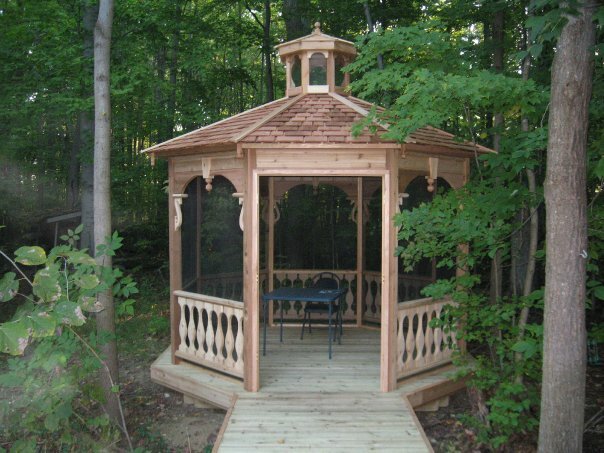 Gazebos & Pergolas are perfect for adding some privacy to your backyard while protecting you from the weather and adding character to your landscape. Whether it’s attached to your house, on your deck or standing free, we have the designers to create exactly what you are picturing. Don’t let the weather keep you inside. Call us today and we will have you sipping on your morning coffee under your new custom designed Gazebo or Pergolas in no time.